The elegant copper pyramid is handmade to the scale of the Great Pyramid of Giza, Egypt, a structure that continues to astound researchers with its mysterious power and unfathomable potential. Pyramid structures gather in and magnify what is known by different cultures as prana, chi, orgone, or life force. Russian researchers continue to experiment with pyramid structures and have found that pathogenic bacteria are greatly reduced, the immune system is strengthened, the health index of newborns improved when given solutions that had been placed within a pyramid, and that even at temperatures of -40°C, water left untouched within did not freeze. Seeds kept inside from 1-5 days had up to 30-100% increased productivity. Fruit etc. will not decay but instead will dry out without decomposing. Ionization of the surrounding atmosphere was also recorded. 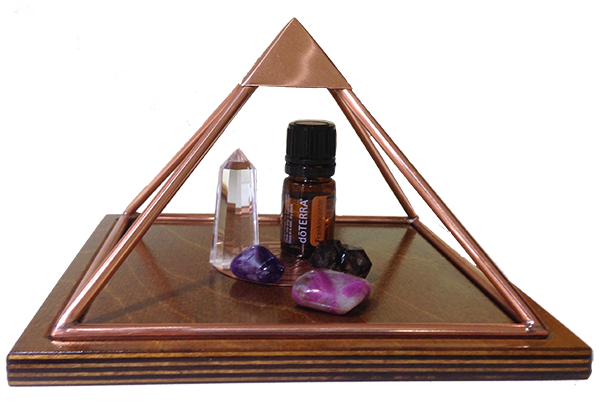 Each Meru Pyramid is carefully hand-made in pure copper, an excellent conductor of energies with health benefiting properties. The detachable bases are made from sustainably harvested Birchwood, sealed and varnished for longevity. Enhance vibration of essential oils, flower essences etc. The Shri Yantra is a 12,000 year old symbol of harmony and union. For millennia adepts have used it to help raise consciousness. In the ancient Vedic version of Feng Shui, known as Vastu, it is used to eliminate negative vibrations and shift stagnant energy in a house and surroundings, promoting good health and material and spiritual prosperity. Shri Yantra talismans are also worn for purification, well-being and protection.